Last month I went to the Slow Exposures photo festival in Pike County, Georgia. It was the second year I attended. I almost didn't go. There is a juried exhibition, which I didn't get into this year, and the prospect of going and not showing something didn't appeal to me when I first got the email notification. But when I got the rejection letter, one of the organizers had added a handwritten note, saying she hoped I came anyway. I had a good time last year, so I decided to go anyway. I'm glad I did. There were several good photography shows to see, interesting panels to go to, and good parties, too. I'm going to have to make this an annual trip, even if I don't make the show. John Bennette, curator of the 10-year retrospective show at the Whiskey Bonding barn discussing his choices. Photographers Sylvia Plachy and Ernesto Bazan chatting at the Whiskey Bonding barn reception. Joy Walker, a supporter of Slow Exposures, who just happens to be the first woman pilot for Delta Airlines. She has fantastic stories. I'd buy a book she writes in a second. Anna Walker Stillman, Jack Spencer and Elisabeth Biondi, some of the panelists for the Saturday Salon. Jerry Siegel shares some of his images during the Slow Book Afternoon. 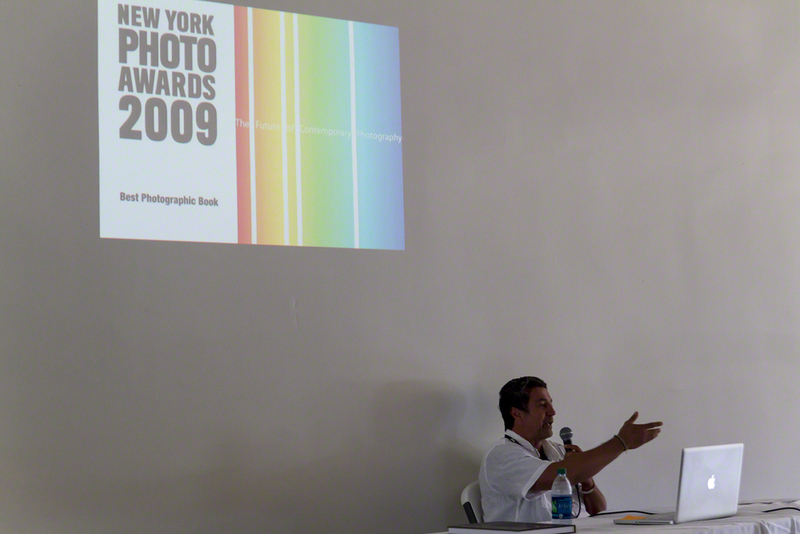 Ernesto Bazan talks about his award-winning books. Jerry Siegel, Jerry Atnip and Ernesto Bazan wrap up Slow Book Afternoon.